Nov 05 2003 The MLC Series are our miniature high capacity compression only load cell\force sensor, featuring low profile compact size for a wide range of portable and dedicated applications up to 30,000 lbs. The load diameter is slightly convex for accurate load distribution. Low deflection thru design results in ultra fast frequency response. The MLC's are designed to be mounted in a shallow machined flat surface, either free or fastened via a bottom 6-32 tapped hole. These load cells are manufactured from heat treated 17-4 stainless steel. The sensing element incorporates bonded foil strain g ages to produce a full scale output of 2mV/V. Accuracies are Nonlinearity .25%, Hysteresis .25%, and Nonrepeatability 0.1% or better. Load cells are supplied with a Certificate of Calibration traceable to N.I.S.T. 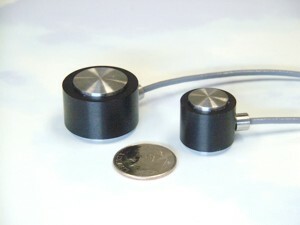 The MLC Series are our miniature high capacity compression only load cell\force sensor, featuring..